Location: Home › Music Articles › Delirious? In one of the most revealing interviews that he's ever given, Martin Smith talks to Mike Rimmer on a journey back in time to pivotal moments in the career of Delirious?. Delirious? have got the American band Sonicflood to thank for that. The band were hugely influenced by Delirious?, particularly by the 'Live And In The Can' album. 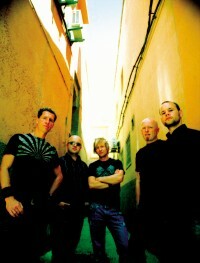 The original line-up Sonicflood recorded a version of "I Could Sing Of Your Love Forever' on their million-selling self-titled debut album. It then became fashionable for American artists to record Delirious? songs. So can I hold Martin Smith personally responsible for some of the terrible worship albums that have been released over the years from CCM artists who, under pressure from their record companies, have been forced to record worship songs in America? "No comment I think!" he smiles. "Some of them have been made by friends that I respect and I think God has changed them in the process of making those records. It's not all been bad. And some of them are just downright terrible! In every genre of music you get the good and the bad don't you?" Martin Smith can be very diplomatic but does he feel it is ironic that back then they were struggling to put out 'Cutting Edge' whereas now everybody is recording worship albums? In the space of under 10 years, the whole scene in America has completely changed. "It's extraordinary really," he admits. "We started our life in America, positioned as a 'CCM band' and now they're desperately trying to position everybody as 'church worship bands/worship leaders' because that's what's selling. It'll switch round again once they sussed out that actually, the whole scene just sounds boring now. It doesn't mean that God isn't in it and that God isn't using it powerfully but the whole creativity has just vanished. So that'll come again." In the beginning, it was the influence of Kevin Prosch that kick-started a lot of the '90s worship scene in the UK. Prosch proved to be the most creative worship leader of his generation. Smith agrees, "I think we all took our lead from Kevin. We all saw that doing church music doesn't have to be boring. We can actually be who we are, turn the volume up, make our guitar amps sound fantastic, get great tones and God love it and be pleased with it. I think that was a really huge green light for us guys; wow, we can be ourselves! We don't have to squash ourselves into Graham Kendrick's mould or Noel Richard's mould.and they're two people who I hugely respect. I just think great, let's be ourselves in this!" One of the critical low points of Delirious? 's career was the release of 'Audio Lessonover' in 2001. The album seemed to be an attempt at creating an artsy rock album for the mainstream but was generally not well received. In America, the album was re-jigged and renamed 'Touch'. Does Smith regret making the album now? "No, I don't regret making that record," he says, "because there are a couple of songs on there that are our finest. I think "Stealing Time", "Rollercoaster", "Alien", "There Is An Angel" and "Angel In Disguise" are magnificent. I think that yes, it was a bad outcome, in terms of it didn't get a great reaction from people. I think it confused people. The worst thing we did on that record was opening with "Waiting For The Summer". I think people just never got past that track, and rightfully so, that was a bad mistake. But because it was the single we thought, let's stick it on first. I think it wasn't us. The producer pushed it in a direction that wasn't us and there are regrets about that. But you live and learn." Smith believes it wasn't all bad, "The positive experience of it was that we learnt more about making records through that experience. The producer pushed us into some really awkward, uncomfortable territory. I know for Stu G that was when he said he became a guitar player - through that record. The amount of stuff he learnt with guitar amps was extraordinary. So all these things come together for good. And then we got back in and made 'World Service' and it was sort of, here we go!" 'Audio Lessonover' contained a song that has always puzzled me and I do think that I'm not alone here. 'Bicycle Gasoline'. "It was just a tiny little love song," explains Martin. "Girls, they don't want flowers all the time, they just need telling that you love them.and vice-versa. A bicycle doesn't need gasoline and she doesn't need all that stuff really. She doesn't need 'things'.jewellery or dresses, she just needs love. You know, love man!" OK, so that's a bit clearer now! "It's the sort of song that could have been a hit record for another band I think," he asserts. "It's a great melody." It's just a shame that the lyric was confusing! "I'm sorry about that!" Martin apologises, "I'm sorry to everyone that's confused about 'Bicycle Gasoline' and the other one, 'Gravity'." In the end 'Bicycle Gasoline' didn't make the American release as Martin explains, "No because it was too edgy lyrically for the Christian market. We took off 'There Is An Angel' as well because it says, 'She's lying there next to me', and they didn't get that. But that was just written about waking up one night and seeing my wife asleep in bed next to me and just thinking, God, I could mess this up if I'm not careful. She's the angel you've put in my life and I need to protect what you've given me. That's actually my favourite song of all time, 'There Is An Angel'. Daniel Bedingfield has often wondered about covering that. So we'll see." The band have had a number of disappointments along the way and not everything has gone their way. Around five years ago, the band decided to set up an American wing to Furious? Records. Unfortunately the venture didn't take off and the band came close to financial disaster because of it. Smith shares, "I think the biggest blow for us was that we felt that we should start the company which we called Furious? Records US. We felt that we needed our own framework there to push out some of the music that we believed in when we knew it would just never get out. The system was becoming too churchy and worshipy and cookie cutter. I just think we felt a responsibility to keep pushing music out there that we loved. And the thing was a disaster. Within a year the thing had gone bankrupt and we'd lost huge amounts of money that we're still paying back now." How close did it come to actually sinking you? "Really close! It got to the point where we wondered if we could afford to make another record. And God's grace, you know, he's always there. I think what it did for us was it put us on our knees again and really made us evaluate what it was we were about. What it was we loved. And I think we've come to realise that we're not businessmen. It's hard enough being a businessman in your own country let alone in America. I think we're at the stage now where we're philosophical about it. We're getting on. We're getting on an even keel. We're still playing live, still making fantastic records. What more do you want really? We're doing good and we'll come out the end of it." Being in Delirious? must affect Martin as a person. He has lived a life that has a public focus to it but I wonder whether he is comfortable being a rock star? He responds, "I think I am comfortable being whatever I have to be on that day. If I'm needed to play that part then I can play that role. But I think they are all characters made up of different parts of you. If I go to Hillsong and preach at a Hillsong church then it's not that you play another character falsely, it's just that they're all parts of me that reflect different parts of my personality." So does he adopt the role of being a rock star? He responds, "I think you just put a different hat on. If you've got SWR Radio in Germany that are playing your single 2000 times in that month and they are wanting you to be that, I can play that part for the day. That's fine. I'll have my photo taken with them all and whatever, you know? I think they are just personas. I think that all those characters are you and to play them well you've got to truly be them in some way. So I am actually really comfortable with who I am in this stage of my life. I feel really relaxed. You ask me the question about God? I'll answer that. Ask me about money? I'll answer that. Ask me about football and I'll answer that! You know? I feel really happy to be where I'm at." So are there are a number of different Martins that could show up? I have interviewed Martin Smith on a number of occasions and on my way to meet him, often wonder which Martin I will get. Am I going to get the worship leader Martin, or am I going to get the rock star Martin? Am I going to get the husband and father Martin? I travelled to today's interview with an intern and I was explaining to her on the way down that my experience of Smith in interviews is that there are different Martins that could show up and sometimes I have the spaced out uncommunicative Martin who doesn't want to talk. I've had him more than once in the past. So is he a split personality? He laughs, "Man, you should interview my wife. Ask her the real answer to that question! Yeah, I can be on it and I can be off of it, there's no doubt about that. Anna, my wife, calls me 'the mystery man'. She says that she's been married to me for 11 years and not really worked out who I am. But she says she kind of likes that. It keeps it interesting!" He continues, "I think I've had to learn to be guarded sometimes in certain situations and I will definitely pull back from some situations because I'm just not sure of what's going to happen. I have to be really protective of my time because I can easily throw myself into things that can actually be time wasting. I've got five children to bring up and be a good husband. Sometimes people probably wouldn't imagine me being nice, I can be quite ruthless with my time just to try and protect that part of my world. Sometimes that will mean being in the studio for nine months almost.and I've spoken to Sam Gibson (Delirious? producer) about this, about almost maintaining quite a distance in a working relationship, because I need to just get in the studio, finish the day, and come out. I don't want to sit in the pub every night being mates. I can't actually do that any more. 'Oh wasn't that great?! Great guitar tone! Yeah, fantastic!' I think all of us guys have had to be a little bit more like that in the last few years. But when the record's done I'll be the first to ring Sam and say, 'I've got two weeks over Christmas. Come up and we'll spend the day or hang out. Bring your wife.' I love that. But it's a challenge trying to keep all the plates spinning. Obviously we've got a church life as well. That is again another world and so there's 12 or 15 couples that you want to have round for dinner and you try and keep your whole world spinning, because that's really important to us as well." Finally he admits, "I can be a bit of a dreamer. I can, in some situations, appear like I'm not interested. Ironically I don't miss a trick but I just sometimes distance myself because I just can't go there. Some people have said that I can appear really rude and I'm sorry for that. I'm trying to get better at that but sometimes you just can't do it all." Thank God for You. A Dj 31 years I love all your music. Became disabled June18, 2006. Went to your concert July 27, 2006 even so i was geeing use to being Disabled in a wheelchair, Divorsed prior to being Disabled. Invite My Mom o go the concert with me. We Both Worshipped. I am going to miss your Ministry in the NEW Songs and In the concerts.... hope to see som e video footage at the Big Concerts. Am going to miss YOU GUYS! really its an awesome testimony ....... through age 2 age god have blessed ,youve helped so many people turn to christ with your GREAT music!Thank God allowing his ministers like you to bless and touch many lives around globe in which people and christian of Ghana can enjoy the sweet words of God. Hey i think what you martin are doing sound good. Martin can you email me because i would like to ask you something. I would like to write a song. I know you dont do that anymore but will you help me? Please? If you dont want to that is okay. Will you email be. I wont give it out. please. Yesterday at Lakewood Church they ended the sermon with "my soul sings" . My daughter wondered what had excited me. Delirious? I said. Are they here? No mom she said.I love your whole group. Your music is extraordinary or supernatural. Really. Come back to Lakewood. The most amazing, inspiring and talented bands in the world. A band that have changed so many lives across the world by following their passion for God. All the best for the future and the next chapter of your lives. soy de bs as argentina. nos gusta mucho su musica,son de mucha bendicion. los estaremos esperando.. exitos!!! First ever vinyl releases for worship pioneers Delirious? Dance troop Delirious have released remix of "Louder Than The Radio"